Posted on March 21, 2017 , in Swim Spas. Swim spas have a lot to offer in terms of versatility, but you want to choose a swim spa with the features you truly need. From fun and fitness to relaxation, your specific priorities and preferences should dictate what you look for in a swim spa. Below you’ll learn what to seek out in a swim spa to ensure that it’s the right fit for your needs. You always want to choose a swim spa company that can help when problems like repairs, maintenance, or other issues arise. Manufacturers and dealers with the best reputations are those that put the customer’s needs at the top of their list of priorities. Choose a company that has been in business for several years and that has been positively reviewed by consumers online. Often, a company’s longevity is a good indication of its reputation. Hydropool, one of the oldest of today’s swim spa companies, has been in the swim spa manufacturing business for over two decades. Swim spa comfort is a key area to keep in mind while shopping as some swim spas are much more comfortable than others. Always look for a swim spa that is deep and wide enough for the number of users that will commonly use the swim spa at the same time. It should also provide enough room for anyone who is exercising to complete a full range of swimming strokes. Don’t forget to try out the seating. Look for seats that are comfortable, provide you with extensive massage options, and have adjustable jets for a customizable experience. All swim spas have differing features and options, so make sure you know what you need and look at swim spas that have these features. 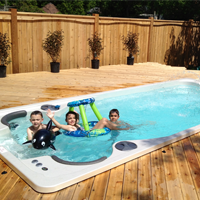 Some swim spas are designed for play while others are for relaxation or fitness. Tell your dealer what you’re looking for and ask them to show you models that are designed for your specific needs. If you’re someone who will use your swim spa to stay in shape, choose one with a strong current, massage options, and water exercise capabilities. For competitive athletes, choose time tracking and a challenging current. If you’re simply looking for a swim spa your kids can happily splash in, ask about fun features like wave pools. If you’re like most swim spa owners, you want to save money. By choosing an energy-efficient swim spa, you’ll be well on your way. To make your swim spa even more energy-efficient, choose one with a quality cover, quick filtering capabilities, and thermal technology that reuses heat from the motor. If you’d rather enjoy your swim spa than maintain it, you’re in luck. There are many available swim spas that can skim, vacuum, and clean for you. Look into brands like Hydropool to get these advanced self-cleaning technologies. Installation style is important to many people and can help you save space and maintain the aesthetic of your outdoor area. Above ground, in ground, in deck, and indoor installations are all available, but you’ll want to choose a manufacturer that has experience in these styles and can customize installation to meet your needs. Now that you know what to look for to know whether a swim spa is the right choice, download our buyer’s guide and see our many available options.